When the Next Recession Comes, Will Your Business Manage? It has been 10 years since the great recession and so many are on the lookout for signs of an impending financial crisis in the horizon. We are still in an era of low interest rates and strong economic growth that many analysts believe there is no reason to worry just yet. However, corporate debts are higher than it has ever been. Many businesses are borrowing against their net worth instead of borrowing against their cash flow and income. In fact, just in the US alone, S&P Global reported $6.3 trillion in corporate debt. Businesses have indeed been borrowing more than they ought to due to low interests since the great recession. The problem is that these businesses that have borrowed more have not at all increased their liquidity. These high corporate debts plus increasing quantitative tightening, Italy´s budget issues, Brexit worries, trade war fears, and increasing interest rates make recession feel like it will come sooner than later. We then ask the question to businesses – when a recession comes, will your business manage? It is never wrong for any business to prepare for tough times which can come any day without warning. It all starts with having control over business finances. The reality is that many large corporations still struggle in getting a clear picture of their company´s real financial status due to the manual nature of their accounting. It is not only hard for them to have comparative historical data, it is also hard for them to have access to real-time figures. Crazy as it may seem, but many finance departments in multinational organizations still do budgeting, reporting, and consolidation in excel spreadsheets. If you are an accountant, you will know that doing accounting tasks in excel is never a good, reliable, and sustainable way. Therefore, for businesses that want to prepare for trying times, it is important that they have clear visibility on their cash flow and income statement among other things. It Is also important that they can test their assumptions and do multiple what if analysis, so they can test the impact of their business decisions on various aspects of the business. For example, when the interest rates rise to a certain percentage, what effect will that have on the company´s cash flow? Or if there is an increase across the board for minimum salary, what effect will that have on the business´ planned market expansion? These things can only be done with a business performance management solution like Performance Canvas Financials. Performance Management tools like Performance Canvas Financials helps businesses gain full control and visibility of the real financial health of their company. By using a performance management tool, you can see exactly where the bottlenecks are and what can be done to remedy them. In addition, because finance departments save a lot of time when accounting tasks are automated, more high value analysis can be performed allowing the business to detect threats in the horizon or allowing it to have access to real-time insights that will allow the business to change its strategy as the situation calls for it. 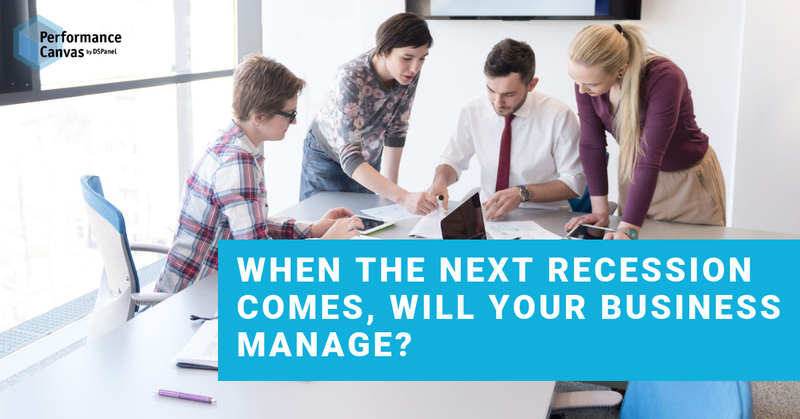 With recession more of a thing waiting to happen, will your business really manage? It is a good question to ask.